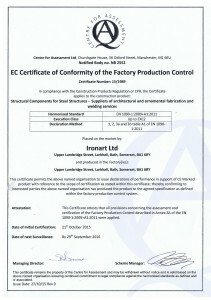 Ironart has successfully completed the rigorous assessment process required to achieve EN1090 accreditation, the European Legislation which came into effect in July 2014 requiring producers and suppliers of structural metalwork to carry CE Marking (Conformité Européene) . In the UK the legislation is also being enforced by the Trading Standards Authority. 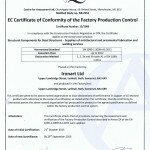 CE Marking demonstrates that Ironart’s products and services comply with essential requirements under the European Construction Products Directive – including health, safety and environmental protection legislation. It also means that our products can be legally placed on the market here in the UK and across the EU. As such all our structural metalwork now carries the CE Mark – either stamped or affixed onto the steel itself or where this isn’t practical, with all relevant CE documents supplied – proving the highest quality and ensuring total confidence from our client’s perspective.